For individuals who are disabled, there are quite a few options for personal transportation. 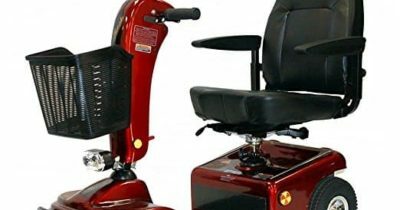 Mobility scooters are devices that are quite similar to wheelchairs as options. The key difference is that they are motorized and have either steering wheels or handles to direct them. They come in different models and usually have three or four wheels. There are different accessories which either come included with the original purchase or may be bought later. 6. Go-Go Ultra X 3-Wheel Travel Mobility Scooter Including 5 Year Ext. Warr. Speed: Finding a scooter that is not too fast and not too slow for you is very important and should be evaluated. Climbing Angle: Depending on where you intend to use your mobility scooter, you may need something with more power, that is able to handle steeper inclines. 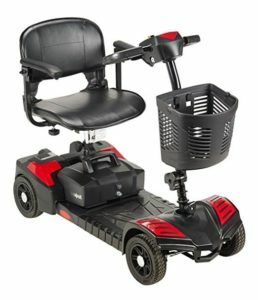 Comfortability: With the amount of time that will be spent in a mobility scooter, you want to be sure you find something that will be comfortable sitting in for extended periods of time. Battery Life: Determining how much charge will be required to get you through the day must be considered when picking out a new scooter. Weight Capacity: Picking a scooter that is designed to support your weight will ensure that its other functionalities, such as climbing inclines or battery life work as to be expected. This review will look at the top 10 best Mobility Scooters in 2019. 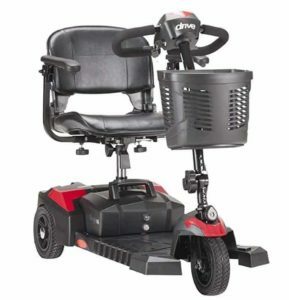 To start the list, we have the Drive Medical Scout Compact Travel Power Scooter. It comes easily to assemble and in 5 large sections. It has interchangeable blue and red color panels with a weight capacity of 300 pounds. It has a 9-mile running capacity, has a top speed of 4 ¼ miles per hour, and a climbing angle of 6 degrees. 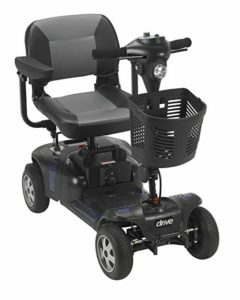 This scooter also comes with padded armrests, backrest, and a conveniently designed delta-shaped steering wheel, making it easy for persons who have the little dexterity to reach. It is raised 2 ½ inches off the ground. The padded seat has the ability to swivel, which can be a problem for those who want stability. Sitting lower on the ground also ensures stability especially when turning, to prevent tipping. It comes with a reasonably sized front basket for carrying items. The comfortably padded seating offering makes moving around easy. Making it to #9 is the Drive Medical Scout Compact Travel Power Scooter. The top speed, weight capacity, height off the ground and run range, are the same as the four-wheel model. This model also has two interchangeable scuff proof panels in red and blue. The seat has the ability to swivel, height adjustability and along with the backrest, both are padded. This makes it easy for people who have little dexterity or strength to reach. This model only has three wheels, which affects its range of motion. The swivel seat can be annoying for some who prefer stability. While having three or four wheels is a matter of choice, the presence of three wheels gives it a smaller turning radius than the four wheel scooter. The adjustable seat and armrests make it suitable for personal comfort. The matter of choosing three wheels as opposed to four is really based on preference. Overall, this is a stable and sturdy mobile scooter. 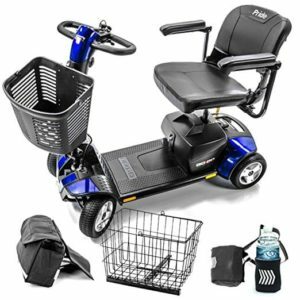 Coming in at #8 is the Pride Mobility Go-Go Sports Electric Travel Scooter. This heavy-duty, but lightweight 4-wheeled scooter comes with a higher weight capacity of 325 pounds. The padded backrest, seat cushion, and armrest add to the comfort. The easy to reach delta shaped steering wheel makes for a convenient design. A large plastic basket is affixed to the front frame. There is also a dual voltage battery pack as well as a standard LED front light for night time use. It has a sporty look, which not be preferable for all types of customers. There are not enough options available with the panels. The package comes with an additional basket for the rear, a cup holder and an armrest bag for keeping items within easy reach. 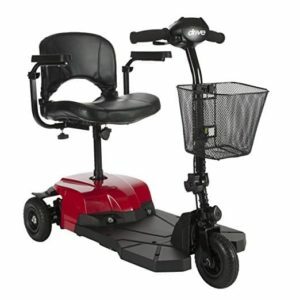 This scooter is comfortable as well as easy to use and handle with a sporty look. #7 is the Drive Medical Bobcat X3 Compact Transportable Power Mobility Scooter. This ultra lightweight 3-wheeled scooter is visibly less bulky than the three previously discussed. It has a padded adjustable seat and foldable armrests, which allow easy entry and exit. Its maximum weight capacity is 265 pounds and has a top speed of 4 miles per hour with a maximum run range of 7 ½ miles. This can be difficult to meet all markets of people who may need a higher weight capacity and faster machine. This has a slightly slower top speed and the lower weight capacity. This model is only suitable for someone small bodied or does not prefer a bulkier model. The angled tiller makes it easy to reach with two horizontal handles on either side. A large, durable metal basket is affixed to the front of the frame. The lightweight nature makes it much more portable. For safety, it has non-marking tires with anti-tip wheels. It still offers excellent comfort during operation. At #6 is the Go-Go Ultra X 3-Wheel Travel Mobility Scooter. This scooter has a convenient drop in battery for hassle free installation in preparation for travel. There is a convenient locking mechanism which allows for single-handed frame disassembly. 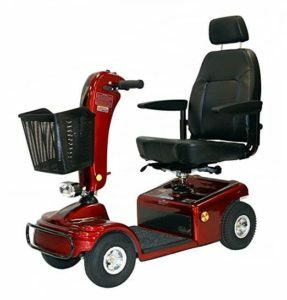 It comes with a 5-year warranty which covers the batteries, battery charger, wiring, joystick, motor/gearbox, brakes, controller, PC board, throttle, tires, metal connection pins, hardware, nuts and bolts, fuses, light bulbs, bearings and bushings, seat swivel mechanism and armrests. 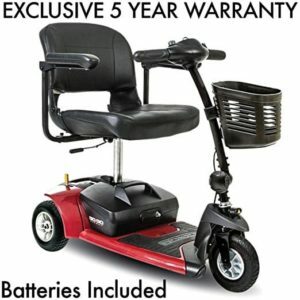 This warranty is an excellent plus for purchasing this model since it covers so many parts related to the scooter. 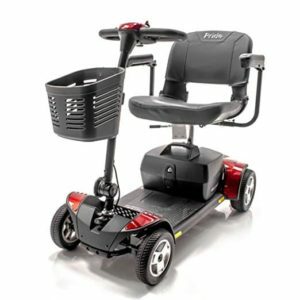 Bringing itself in at #5, this Drive Medical mobility scooter has an appealing appearance. The top speed is 4 miles per hour, with a maximum range of 15 miles and a weight capacity of 350 pounds. The armrests can adjust for easy access, while the seat and backrest are adjustable and padded. The tiller is also adjustable for comfort and the throttle is a finger pull for those who may have challenges. The higher weight capacity accommodates a wider range of users. Given consumers more than two options for colors. The seating has two tones: gray and black. Made the front basket a little smaller and less bulky-looking. Unlike many other models, this one disassembles into four parts rather than five. Of the ones we have reviewed thus far, this one surpasses them all in terms of the cruising range and the weight capacity. As a result, it is more suitable to a wider range of people, and it also has a very sturdy construction. In the fourth slot is the EV Rider Transport Folding Travel Electric Mobility Scooter. This four-wheeled scooter has a maximum weight capacity of 250 pounds and a maximum speed of 4 miles per hour. This model is foldable which makes transportation easy. It has two smaller wheels while folded which makes it easy to roll along for easy portability. It uses SLA batteries but can also take lithium batteries, giving it added flexible battery options. It has a minimalistic appearance. It is lightweight which means limitations on the weight of the person and speed of the machine. It does not come with armrests. The padding on the seat cushion and backrest are minimal and there is no attached carrying basket. 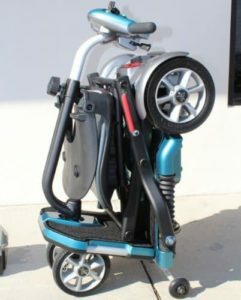 If you are looking for a lightweight mobility scooter, good weight capacity and is easy to stow away without disassembly, this model is a perfect choice. It allows for hassle free travel and transport while remaining in one assembled unit. Making it to the top 3 is the Go-Go Traveler Elite Plus. It disassembles quickly into 5 pieces and includes the basket. In fact, disassembly takes about a minute and the assembly is quite simple. The backrest, armrest and seat cushion are amply padded for comfort. The chair swivels and the height is adjustable to your comfort level. The delta style steering on the tiller makes it very easy to be accessed and controlled. The maximum cruising speed is about 5 miles per hour and the weight capacity is 350 pounds. This scooter comes with two sets of color panels which are not a lot in terms of options. The Go-Go Traveler Elite Plus is every easy to take apart and to put together. The panels also prevent scuff marks and scratches. This purchase includes a year of labor, which is a one year warranty for the company to fix anything that goes wrong with the scooter during the period. The cruising speed is also better in comparison to all the others so far. In second place is the Shoprider Sunrunner Personal Travel Scooter. This 4-wheeled scooter looks more like a fun scooter bike with an office chair attached to it. The fact that it can handle 300 pounds of weight and runs at a maximum speed of 5 miles per hour. The battery has a whopping 25-mile capacity. This model comes with very ample seating. The backrest is actually pretty high, which gives great back support. It is actually called a deluxe captain seat. The seat is also able to slide forward and backward for comfort. It also swivels to accommodate easy entry and exit from the scooter. The headlight is large so the lighting is a little challenging because of how low the beam falls from the frame. 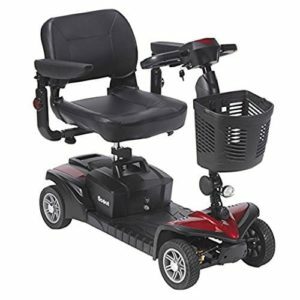 The deluxe seating and long range cruising capability of this mobility scooter make it a winner. The four wheels make it secure in terms of turning and the inclusion of a mirror as a standard accessory makes it more appealing and safe. And the winner is…the Drive Medical Scout DST Travel Scooter. This model has four wheels and Dynamic Suspension Technology. It runs at a top speed of 4 ¼ miles per hour and has a maximum weight capacity of 325 pounds. The dynamic suspension technology makes this scooter function well on all types of terrain including paved, grassy, sandy or gravel. The seat, backrest and armrests are padded and contoured, and the backrest can be folded down. This model comes with two sets interchangeable red and blue panels and can be easily assembled/disassembled, but it only gives users two options to choose from. A variety of colors would have been nice to have. This technology results in a very comfortable ride and is built into both the front and rear wheels. The design features, such as the DST, makes this a true all rounder as far as mobile scooters go. The ability to drive with ease and comfort on all terrains gives great freedom to someone with limited mobility. This scooter allows them to increase the scope of places they can travel to independently. People with disabilities, unfortunately, have limited mobility options as there is. So, when it comes to getting around, it only makes sense that the machine they choose should have all the features they are looking for. When reading through this review list, identify the priorities in choosing the right scooter and you will not be disappointed with your choice.